"The future, madame, is something we should have started on a long time ago." Georges Franju is renowned as being one of the founders of the CinémathÈque Française, together with Henri Langlois. He wasn't just a film lover, but a filmmaker, and even though he was working at the same time as the French New Wave, he had little to do with such efforts. His pictures are more in line with those of Clouzot, but they also have an artistic flair reminiscent of Renoir that's highly commendable. 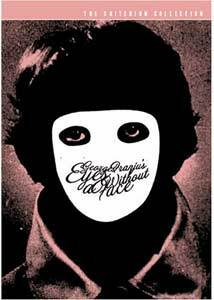 One of the more disturbing horror films ever to come out of France, Franju's Eyes Without a Face manages to be both brutally nasty yet elegaic and beautiful. Dr. Génessier (Pierre Brasseur) is a notable doctor in the field of transplantation, having developed a successful method for preventing skin and other organs from being rejected by the host. But his work is more than theoretical: his daughter Christiane (Edith Scob) has lost her face in a car wreck and although the world believes her dead, the doctor is keeping her at home and attempting to help her. With the aid of a former patient, Louise (Alida Valli), Génessier lures young women to his home to remove their faces for experimental transplants. But even though Christiane wants her face back, there may be limits to what she's willing to do. This storyline will probably sound familiar to horror aficionados, since it has been repeated many times since; cult director Jess Franco returns to it obsessively in pictures from The Awful Dr. Orloff to Faceless, over a span of more than 20 years. But few imitators begin to rival the artistry of Franju's picture, which juxtaposes the gory horror style of Hammer with a dreamlike fantasy that would find its fullest expressions in the vampire films of Jean Rollin. Eyes Without a Face is comprised of a vast array of contrasts, beginning with the stark white of trees against the solid black of night under the main titles. The aforementioned gore sequences form a jarring contrast to the beautiful and pensive moments such as Christiane gliding through the cavernous house. Christiane plays brisk, lighthearted music as she weeps in self-pity in her room. Perhaps most poignant of all is the contrast between the dewy softness of her eyes against the cold, smooth hardness of her plaster mask. While Valli is memorable as the faithful servant luring women to their doom, and Brasseur capably presents the parent tormented both by the guilt over the disfiguring wreck that injured his daughter and his inability to cure her, Scob steals the show from behind her mask. Incredibly ethereal, impossibly frail and waiflike, she conveys her alternating joy, despair, and self-loathing with pure physicality, nearly all the while unable to use her face to act. Perhaps the most moving sequence is her pathetic attempt to call her former boyfriend, who thinks her dead, but she is unable to bring herself to speak. The fairy tale atmosphere is heightened by the curious Snow White collar on Christiane's gown. Scob's makeup is only briefly glimpsed, and even then it's out of focus, which helps keep the proceedings on a higher artistic level than just going for the shock value. It's really more effective this way, and gorehounds who might be disappointed by the makeup certainly will be pleased by the bloody and hard-to-take face surgery sequences, shot in a hard light that forms yet another contrast to the soft and mellow photography used throughout. While not everyone's cup of tea, this is one of the more artistically accomplished horror films, and it can rightfully take its place among the very best in the genre. This is the original French cut, with the changes made for the American drive-in market under the more lurid title of The Horror Chamber of Doctor Faustus eliminated. Image Transfer Review: One gets so used to seeing this in scissored and murky prints that Criterion's transfer is a true revelation. Even though this was always a beautiful film, the added detail brought out in this transfer from a fine-grain positive is startling. The black-and-white photography looks gorgeous, with excellent greyscale and shadow detail. There are still a few nicks here and there, but nothing serious. Even difficult checked patterns are free of aliasing and other problems. Fog is well-rendered and textures are superb throughout. Many sequences look as if they were just shot. A sparkling transfer that's among the finest on DVD. Audio Transfer Review: The 1.0 mono French track still has significant hiss and noise, although the liner notes indicate that restoration and noise removal work was done upon it. In any event, the audio transfer is good enough to make the looped dialogue quite obvious. The music by Maurice Jarre suffers a bit, with slightly clipped and very shrill sounds in the overly loud main title sequence. Extras Review: Criterion provides a varied array of extras, though surprisingly enough there's no commentary; this would seem to be a natural film to allow extended comment upon Franju's technique or even better to hear from Scob herself. The most significant extra is Franju's 1949 short documentary, Blood of the Beasts, which takes a look at the slaughterhouses just outside Paris, complete with gory slaughter footage of horses, sheep, and cattle. PETA members will probably want to either shy away or to use it as a recruiting film, because it's shocking in its presentation even if you've seen butchering done live. Franju courted controversy for juxtaposing these scenes with shots of children peacefully playing nearby, with the blood pouring into the streets as a link between the images. A 2m:54s segment features Franju discussing the context and sense of artificiality behind the film. In another longer segment (5m:28s) Franju discusses "Le Fantastique." This interview includes a short clip from the feature demonstrating the usual abysmal condition that it bears, for striking contrast with the presentation here. Finally, a 7m:07s featurette presents the writers, Pierre Boileau and Thomas Narcejac (who also wrote the source novel for Clouzot's Diabolique), discussing their technique. The liner notes by David Kalat and Patrick McGrath are thoughtful but not overwhelming as is so often the case with Criterion's booklets. A gallery of stills and poster art features some clear shots of Scob' makeup, which only go to show that Franju had the right idea in losing the focus. There are also four posters from around the world and over 25 lobby cards. The bow on the present is a pair of trailers, one from France and one a US drive-in double feature with The Manster. But why no alternate title sequence from the Dr. Faustus version? A beautiful and disturbing classic of the horror genre, given an exemplary video transfer. The extras are a little weak, but it's certainly nice to have such a presentation for this picture.